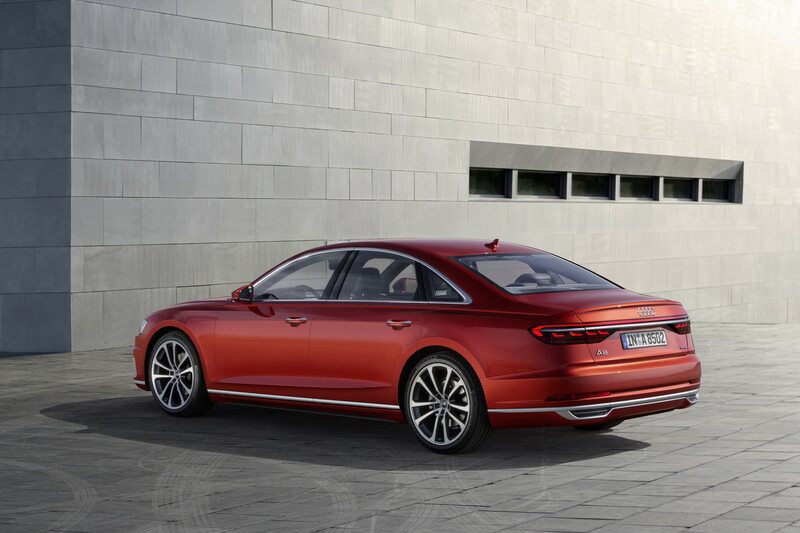 After weeks of previews and teasers, Audi finally revealed the all-new 2018 A8 at the Audi Summit in Barcelona on Tuesday. 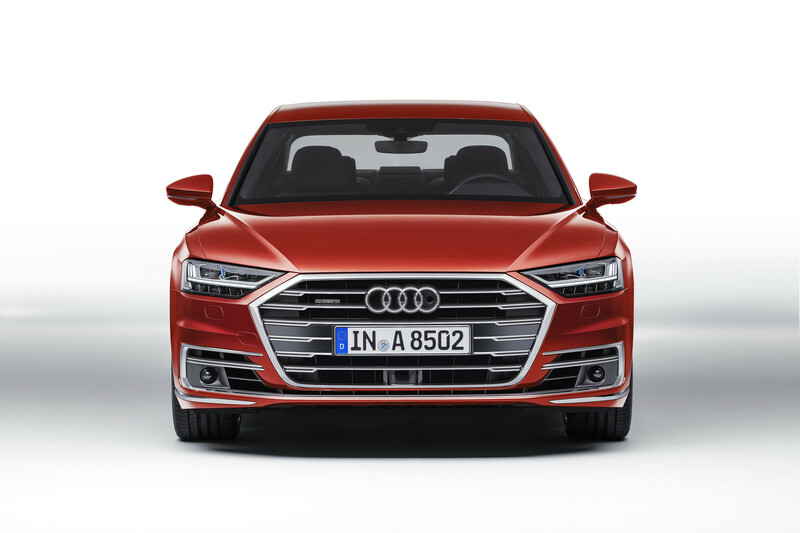 Thanks in large part to those very same previews and teasers, most of the new Audi A8's headlining features come as no surprise...but considering many of them represent the future not just of the VW Group's mainstream luxury brand but the automotive world in general, they're every bit worth taking a look at. 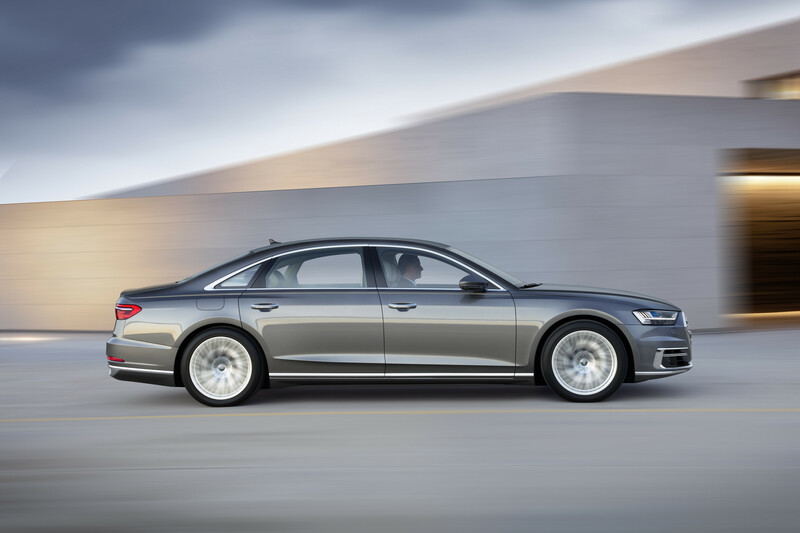 Chief among the innovations brought to bear by the 2018 Audi A8: Level 3 autonomous driving—or, in the carmaker's parlance, Audi AI Traffic Jam Pilot. 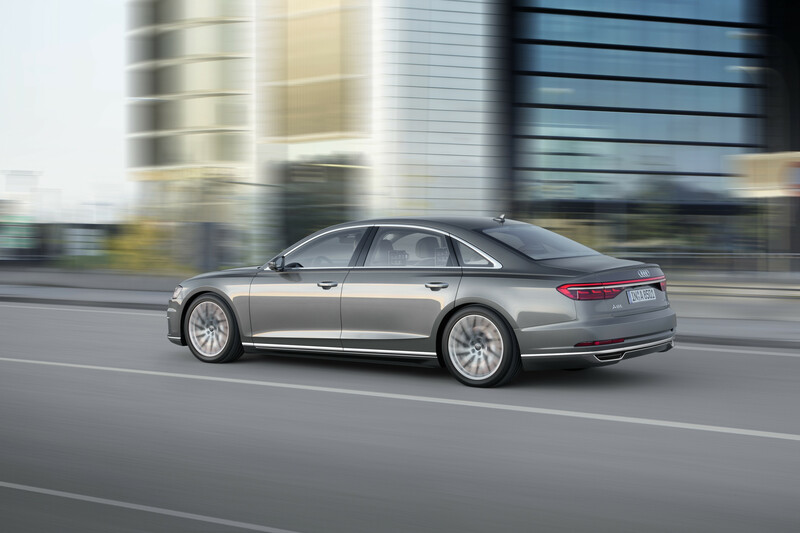 Using a combination of lidar (a production car first, according to Audi), a forward-facing camera, radar, and sonar, the A8 is capable of driving all by itself at speeds of up to 37 miles per hour. There are, not surprisingly, a couple caveats: The system only works on highways with a physical barrier between the traffic traveling in different directions, and it's subject to the legal whims of whatever nation the car is on sale in. 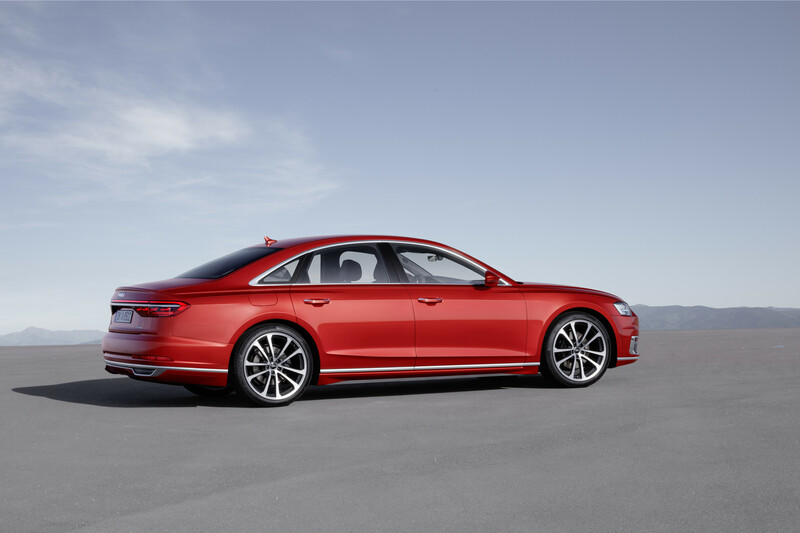 Audi says it'll be "adopting a step-by-step approach to the introduction of the traffic jam pilot in production models"...which means early adopters may not be able to jump in and drive off hands-free in every market. Still, they should be able to play with the other two Audi AI semi-autonomous features, Remote Garage Pilot and Remote Parking Pilot. 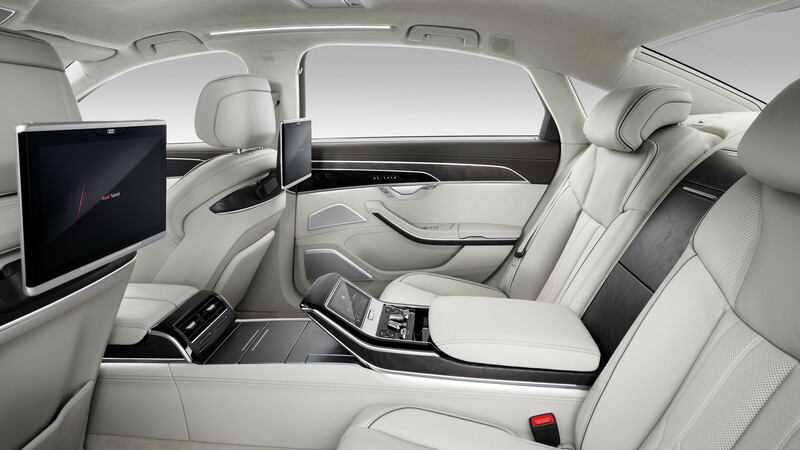 Those systems are designed to let owners maneuver their A8s in and out of tight spaces using a smartphone app. 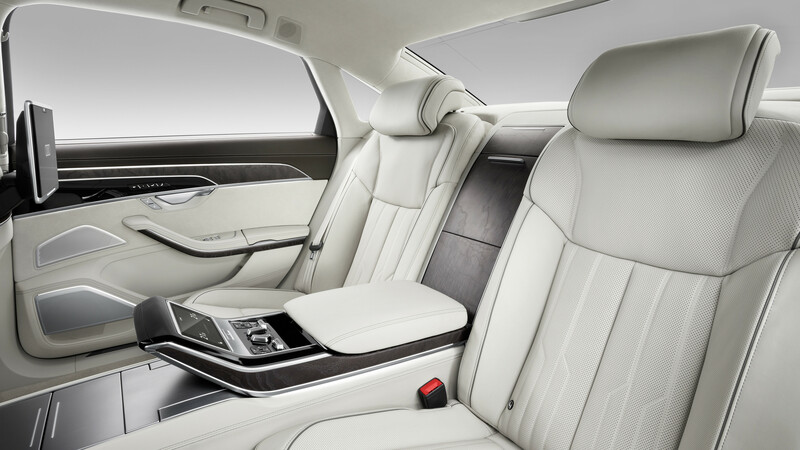 It's the sort of feature that's becoming increasingly common on high-end luxury sedans—a category in which, presumably, owners are often of the well-fed variety, and would thus like to avoid squeezing themselves in and out of narrow gaps between vehicles. 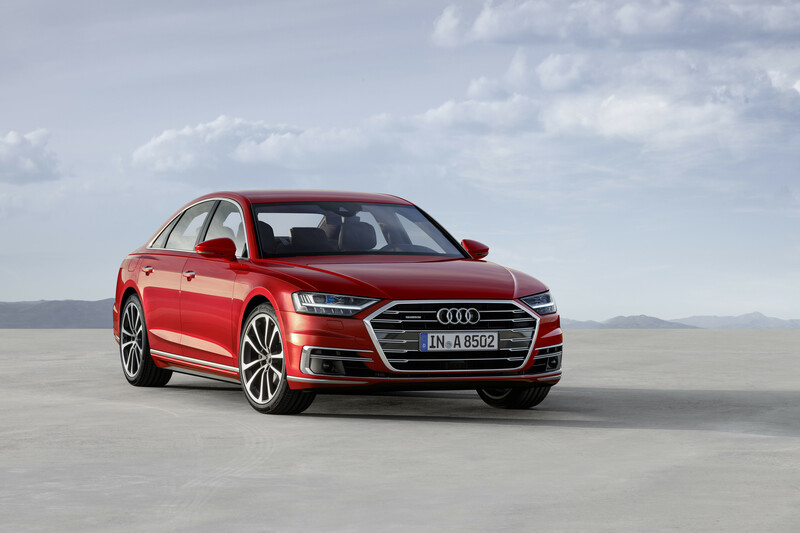 The new Audi AI nomenclature (which the company is extending to all sorts of advanced technologies) also comes to the 2018 A8's active suspension, which uses electric actuators to raise and lower each wheel independent of the rest. 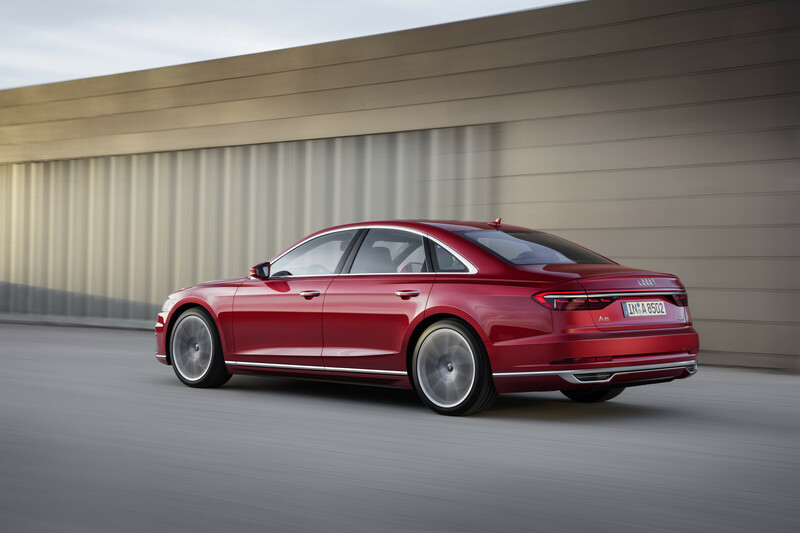 As we've already seen, that—combined with a forward-facing camera—allows the A8 to preemptively counteract bumps and potholes, but Audi says the system also contributes to safety by vaulting the car's body up in the event of an incipient lateral impact. 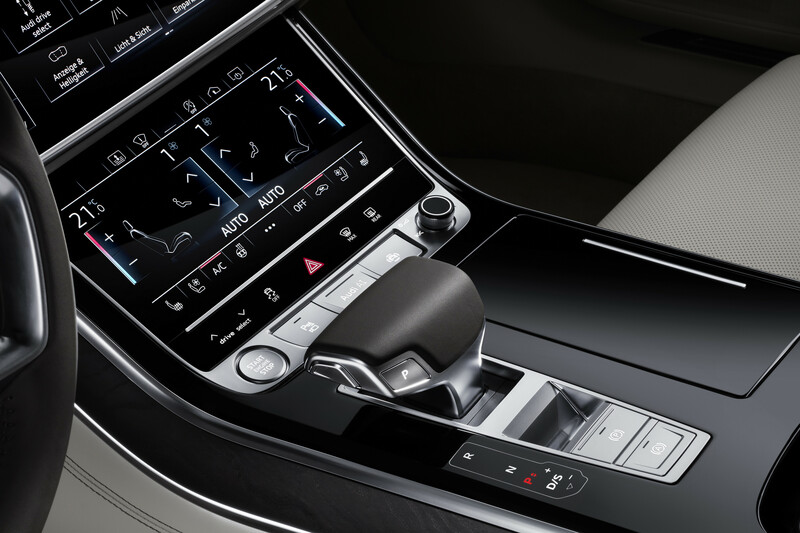 Inside, the old MMI system has been ditched in favor of touchscreen after touchscreen—rather literally, as the 10.1-inch one for the infotainment system has a second one for the climate controls directly beneath it. The screens offer haptic feedback, physically and audibly clicking when touched. 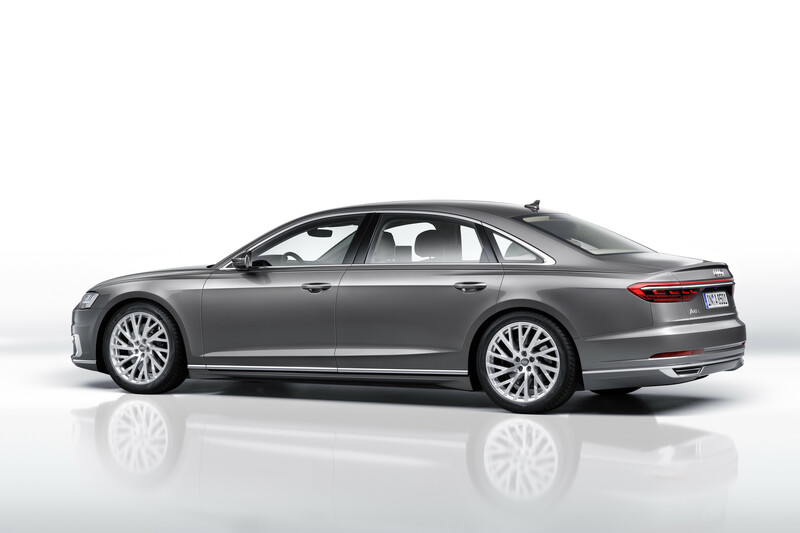 Audi also touts a "new, natural form of voice control" in the 2018 A8, should you be the sort of person who likes to use Amazon's Alexa to order toilet paper. 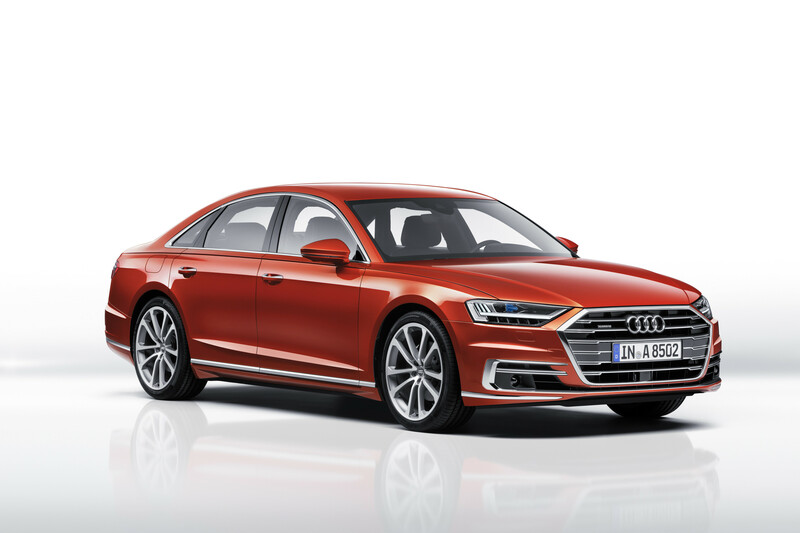 As we learned earlier, the new A8 will come equipped as a super-mild hybrid, thanks to the added juice provided by the car's 48-volt electrical system. 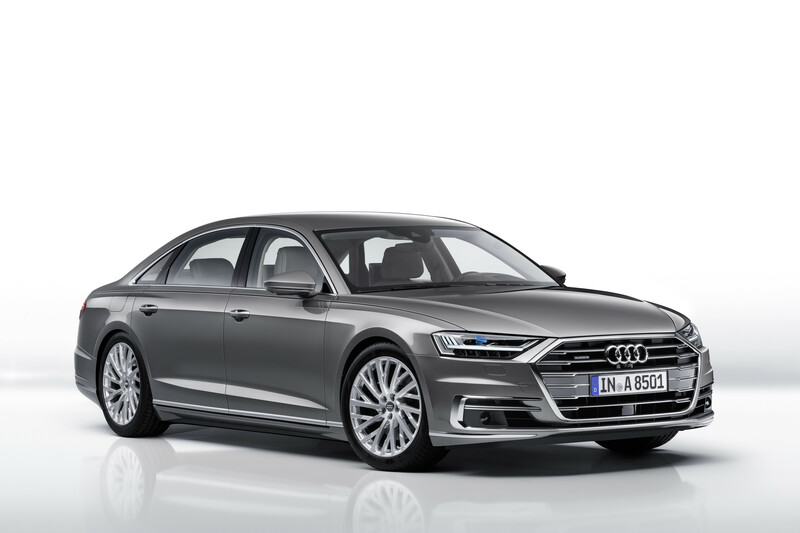 Somewhere down the road—Audi didn't specify exactly when—a plug-in hybrid model dubbed A8 L e-tron quattro will join the lineup, making a maximum of 443 horsepower and 516 pound-feet of torque while also offering more than 30 miles of electric-only range thanks to a lithium-ion battery capable of wireless charging. 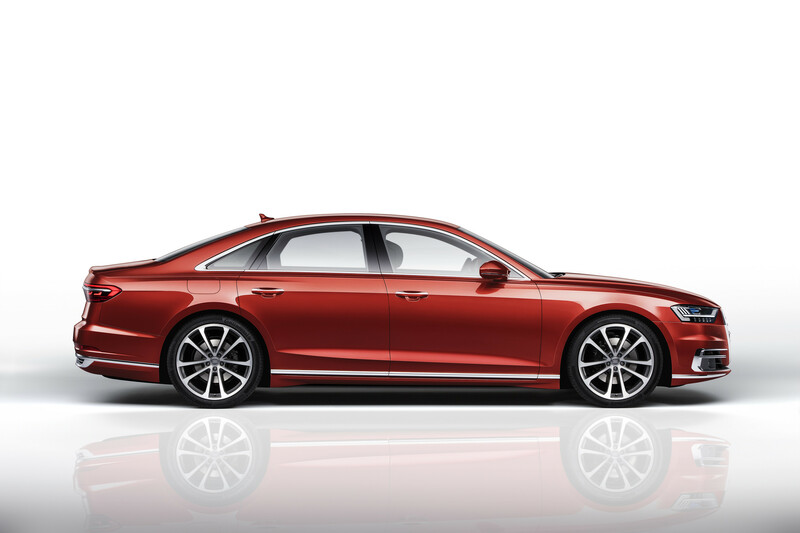 Until then, A8 buyers will have to content themselves with a choice of either a 3.0-liter turbocharged V-6 or a 4.0-liter turbo V-8, each available in gas or diesel form. (Well, not so much in the States.) 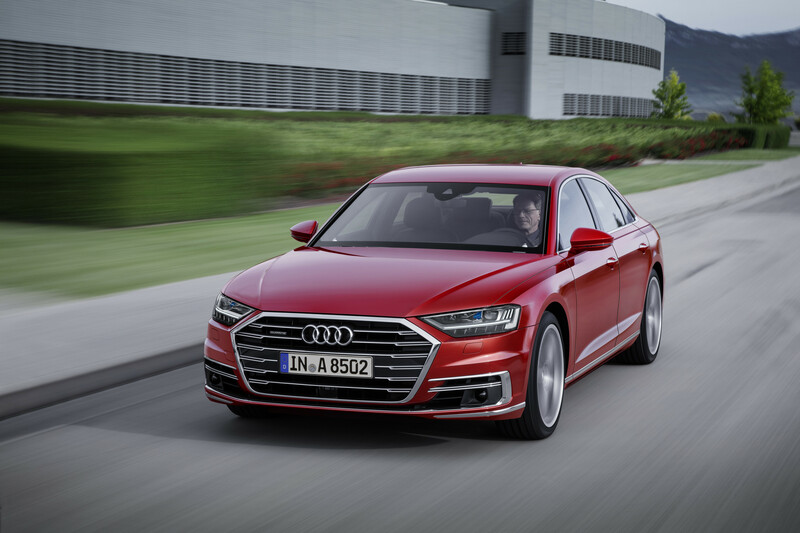 Don't expect the aforementioned 48-volt mild hybrid setup to boost the mileage all that much, though; Audi says the 48-volt system saves around one gallon of gas for every 310 miles of driving in the real world. 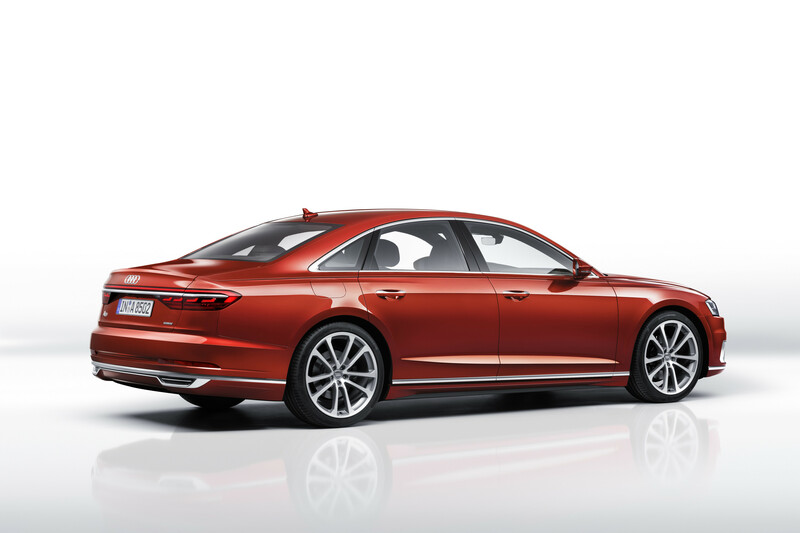 The six-cylinder versions will be available first, followed by the eight-pots; a W12 model will also join the lineup at some point, and while Audi didn't mention it, an S8 is all but guaranteed. 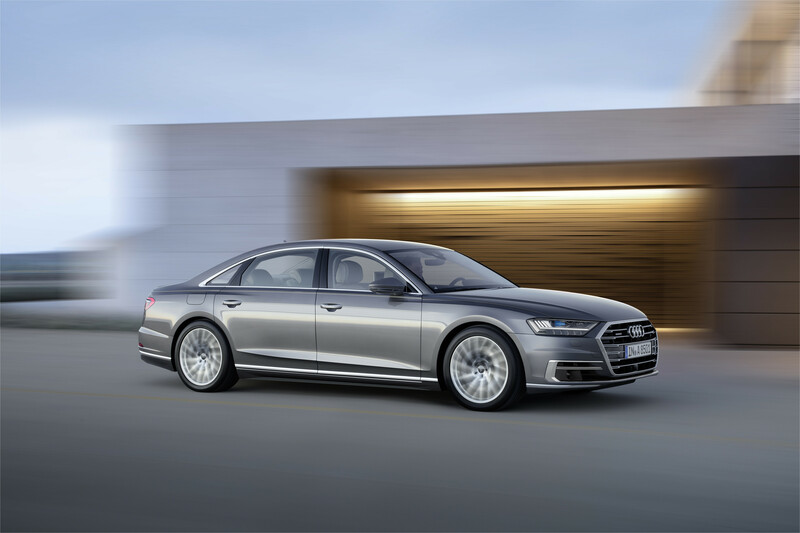 The new 2018 Audi A8 goes on sale in Germany this fall, starting around €90,000. Expect it on sale in America shortly thereafter, probably for a hair less than $100,000. 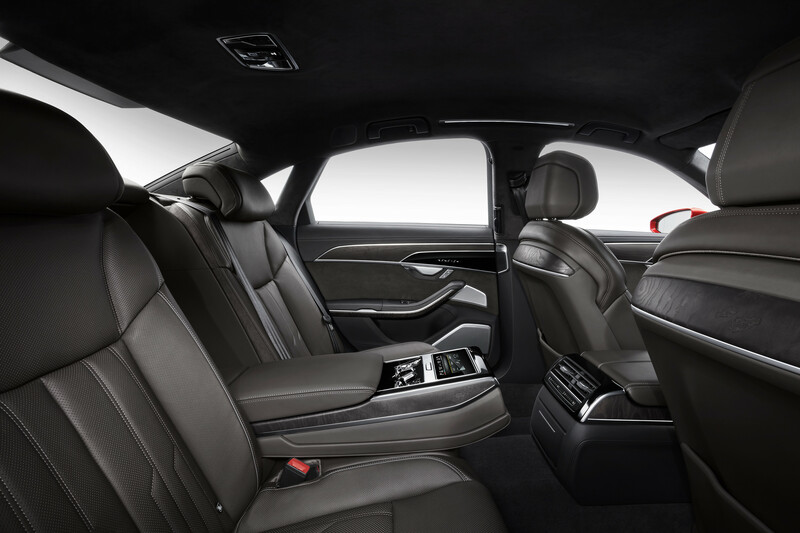 And a look at how the executive sedan parks itself.